Known for adventuresome programs and exciting interpretations of both time-honored and unfamiliar repertoire, the 2018 Methow Valley Chamber Music Festival will showcase some of the most challenging masterworks of chamber music, including quartets by Bartók. 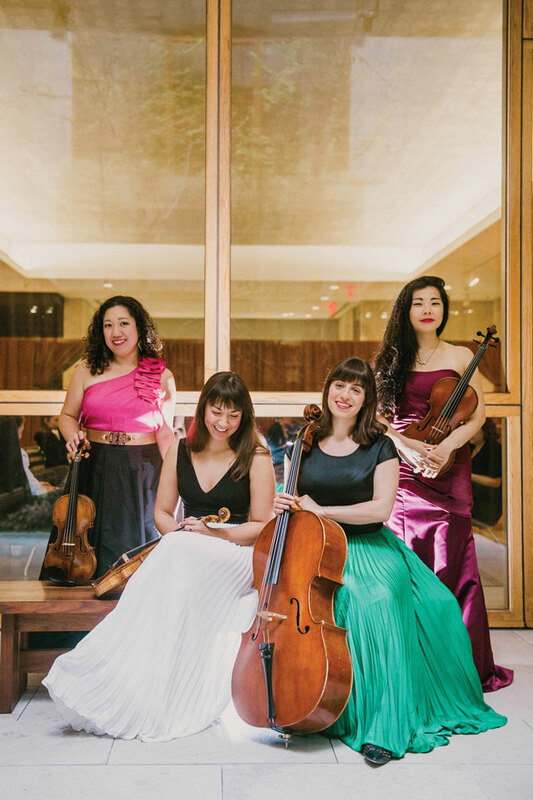 The Aizuri Quartet, winners of the 9th annual Osaka International Chamber Music Competition, and currently quartet-in-residence at the Metropolitan Museum of Art in New York City, will headline the Festival’s 23rd annual summer concert series this July. Festival veteran and audience favorite Ayane Kozasa, who wowed audiences in previous years with her sensitive viola playing, is a member of the quartet, and is the driving force behind their Festival debut. “I want my colleagues to experience the magic of this place,” Ayane said. The Aizuri Quartet has been attracting attention as a stand-out among top ensembles, with the New York Times reviewer praising their “imaginative programming” and their “genuinely exciting” playing. Having an established quartet enables the festival to present demanding music in the kind of interpretations that develop when an ensemble has had the opportunity to refine its performance over time, said Artistic Director Kevin Krentz. Krentz enjoys highlighting unusual instruments in addition to the more-traditional strings and piano, and this year will be no exception. Several concerts will feature three of the Northwest’s most dynamic percussionists, in music for percussion as well as “an incredible arrangement” of a late Shostakovich symphony, said Krentz. Returning artists include violinists Elena Urioste and Grace Park, cellists Krentz and Matthew Zalkind, violist Kozasa, and pianists Tom Poster and Ryan MacEvoy-McCullough. The Summer Concert Series will feature five Centerstage concerts in the barn at Signal Hill Ranch, plus informal performances around the valley, informative lectures, and free open rehearsals. DATES AND CONTACT: The Festival takes place July 26 to August 4. Program information, tickets and full summer schedule will be available at www.methowmusicfestival.org starting May 15.